My last food package to collect for this long leg between real towns where resupply is possible is waiting for me at the Lake Coleridge Lodge. They had emailed several weeks ago to let me it had arrived. 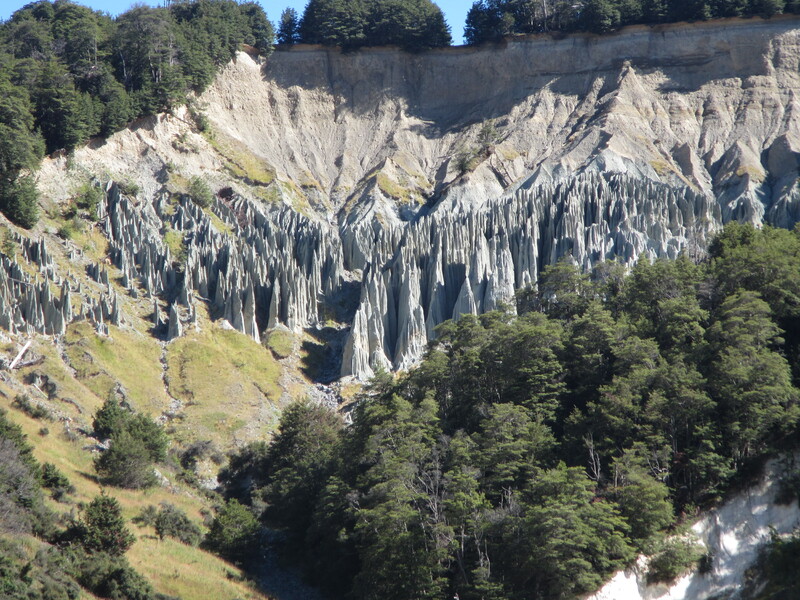 I’d made prior arrangements to stay at the Lodge and use their shuttle service to get around the Rakaia River hazard zone and had changed plans on them several times already. They are a patient lot and have been really accommodating to work around me. It’s a remote lodge and they need to know well in advance when people are coming and if guests want catering so the lodge can pre-shop and have things sorted for guests arrival. On my last contact with them I said I would be arriving on Sunday and would use the shuttle service on Monday. They were fine with that. What I didn’t really factor in was my quick pace. 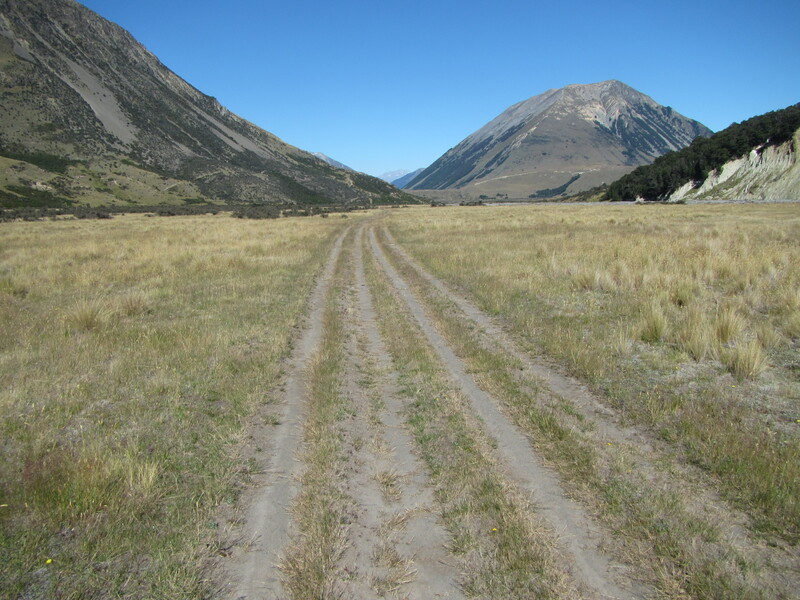 Initially I was expecting four days of walking from Arthurs Pass to the Lake Coleridge Lodge but as it turns out I could easily get there in 2 and half or 3 days, not 4. So not wanting to muck them around any more I’ve decided to take my time, having a nice leisurely stroll spread over four days. With no need to rush I turned my watch alarm off yesterday evening and had a nice long sleep in. I had Hamilton Hut to myself last night and so didnt have the typical noise of everyone else rustling around packing gear, slamming doors or the roar of propane stoves chuffing away. After a long slow wake up I had a nice slow coffee on the outside deck of the hut, enjoying the morning stillness and nature awakening around me. I was out of the hut by around 9:30am and had all the time in the world to walk the 18 kilometres to my destination for the day, a small free camp site on power company land on the edge of the Harper River near where it has been diverted into Lake Coleridge. On walking away from the hut and continuing on my path the perfect track continued where I left it yesterday. It was only a short walk, perhaps a kilometre, before the walking track petered out and an old 4WD track took over. I’m not sure how 4WD’s actually get in here but judging my old tyre prints it seems they do. The track follows along the shingle banks of the Harper River and crosses it a stack of time, I lost count. Straight into it this morning – wet feet – with the amount of crossings required today it just wasn’t worth trying to keep my shoes dry. The route was easy to follow. On flat ground the pace was quick was the kilometres were coming easy. Around five kilometres in, a more formed 4WD lead the way,away from the river but still quite a few minor creek crossings. Walking along in my own little world I was thinking I should take some photos. 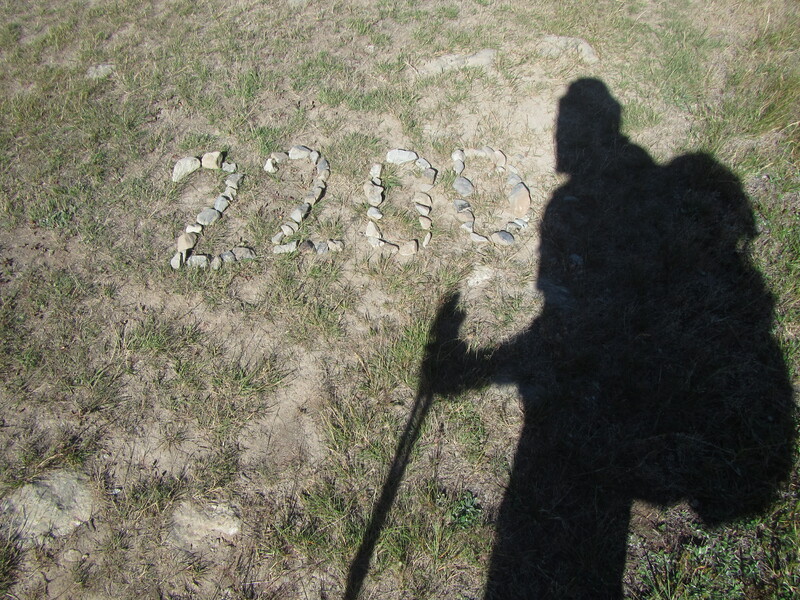 And right then I came upon an arrangement of grey stones contrasting against the dirt marking the 2200 km point. Nice one. Not far from here I passed The Pinnacles, weathered rock formations on the far side of the river, another photo opportunity. Just past The Pinnacles Te Araroa leaves the Craigieburn Forest Park and enters into the Glenthorne Station, one of the many large farming properties that has allowed access to walkers. I continued on the 4WD track into the station property and had a few more river crossings to contend with, initially back over the Harper River itself and then across the Avoca River before its confluence with the Harper. Crossings the rivers separately hopefully means less water flow than would otherwise be case if crossing the main river below the confluence. All the crossings today were fine, the deepest being just above the knees. The Avoca had quite a braids to cross over its one kilometre wide basin. From this point I was most definitely out the forests now and following through wide grassy valleys with long ridge lines and domes rising a thousand metres above. An entirely new landscape. Once safely across there were no more crossings to contend with for the day so I found a nice shady tree to have lunch under while my shoes and socks dry in the sun. With no hurry today I stretched lunch out, lazing about reading my book until my gear was dry. The sun was out and made for a lovely day. The trail then continued onto a formed farm road which made for fast really fast walking, so fast it had me surprised. I typically navigate from the map, reading the features around me like the hill sides, changes in vegetation, roads etc…. This new landscape was open, not sheltered in trees, and made for easy recognition of the surrounding hills. I was tracking my progress on the map against one particular mountain, Mount Ida, which sits at 1695m, knowing that when I approached the western tip I would be getting close to finishing for the day with only a few kilometres to go. So I was surprised after only an hour walking on the farm road that I was getting close to that western side of the mount. I thought that can’t be right, maybe I’m looking at a different peak, nearly 6 kilometres an hour, when for weeks my speed had been closer to 3-4km/hr. I was confused and pulled my GPS out to confirm my location. Sure enough I was where I placed myself on the map. That was way too early in the day (around 2 pm) to be getting close to finishing for the day. What the heck I’m in no rush today – I found a big willow with plenty of shade and set up myself up to read my boom for over an hour and enjoy a cup of tea. I never do that. Slowing down was great today. To take my time, have a long lunch, sit in the shade to read and drink tea along the way was awesome. I’m looking forward to repeating this tomorrow on my slow walk to Lake Coleridge Lodge, perhaps even go for a swim, but I can’t make a habit of it or I’ll never to get to Bluff. Well, maybe in a few months. Hmm… sounds tempting.